​​​o help our customers in dealing with their data loss and to aid them in avoiding further damage & thus maximizing the possibility of a full recovery from their hard disk and other storage media. As Seagate is the world’s number one hard disk manufacturer, we have the world’s most advanced technology in recovering seemingly lost data. However, it’s important for our customer to understand that hard disk drives have delicate mechanical & electronic parts and the recovery process is also contingent on how the drive is being handled. For example, if it being attempted by an unqualified engineer or in a non-conducive environment, further damage will be caused and thus minimizing the possibility of any successful data recovery. Seagate Recovery Services brings the expertise of the most highly skilled, professional recovery technicians to retrieve the data you need when you need it. Whether you need to recover critical business data or irreplaceable personal files, Seagate provides specialized knowledge and cutting-edge technology to work for you. Our "no files, no charge" policy and proven record of service excellence make Seagate Recovery Services—your last line of Digital Defense. ​​​​All incoming data recovery jobs by default will follow our strict in-house non-disclosure agreement (NDA). We treat our customer’s data with the highest level of confidentiality. To assure our customers who are experiencing data loss, Seagate ISO 9001:2000 certified recovery services operations processes are in place to lessen any trauma associated with the data loss. With a No Data, No Charge policy, our customers have the peace of mind in engaging our services – one that they can trust – knowing that Seagate is the leader in hard disk drive technology. Feel free to send us an e-mail at: info@datasavers.com.sg or Call us, Data Savers at +65 64933441 (http://www.datasavers.com.sg) now to begin the hard drive data recovery process or to enquire about our data recovery services. Recover your lost data now with us today! ​​​​Why Should You Choose Us to Recover Your Valuable Data? 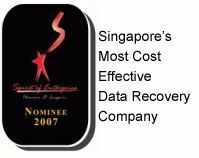 Choose Data Savers Pte Ltd in Singapore, Seagate Recovery Services in South East Asia, the preferred data recovery experts that offers MORE than just your Data Back. price for all with no hidden cost. if Seagate is unable to recover 70% of user files. ​​​We have the Most Cost Effective Professional Data Recovery Rates possible in Singapore and in the South East Asia Region. Our Evaluation of your Storage Media is Absolutely Free of Charge with No Hidden Costs or Unexpected Fees. Dedicated Data Recovery Specialist Case Manager. We are One of the Only Authorized Seagate/Maxtor Partner to perform Class 100 Clean Room Hard Drive Evaluation and Data Recovery without Voiding Equipment Warranty. We have Fastest Hard Disk Drive Data Recovery Evaluation Time Frame without ever to Pay a Premium Fee. World Class Seagate Recovery Services' Advanced Data Recovery Facilities and Techniques. All incoming data recovery jobs by default will follow our strictin-house non-disclosure agreement (NDA). We treat our customer’s data with the highest level of confidentiality. The recovery process is carried out in a controlled environment using Class 100 clean labs and Class 10 horizontal flow clean benches to protect media and all recovery equipment from contamination. Seagate Recovery Service has full service lab facilities that are prepared to address all failure modes using the industry's most advanced recovery technology and procedures. Only Platinum Partner in Singapore, South East Asia Since 2006. ​​​​​Professional Expert Data Recovery Services from Network RAID 0 1 5 10 Server NAS SAN. Emergency Recover Retrieve Restore Data. SATA IDE SCSI Solid State, Hard Disk Drive ( Seagate Maxtor Toshiba Fujitsu Hitachi Western Digital WD ) Corrupt Failed External USB Macintosh Mac IBM PC Laptop Thumb Drive Memory Flash Card and All Storage Medias failure. Get your Valuable corrupted crash dead overwritten Data like Photograph Photos Document Outlook Lotus Notes E-mail PST Personal File Microsoft Office Excel Word Powerpoint Precious Memories Back. Data Recovery Services by Data Savers Pte Ltd - Singapore Data Recovery Centre Providing World Wide Cost Effective Data Recovery Services to our Clients. ​" Never leave recovering your lost data to chance, only trust reliable professionals, like folks from Data Savers, Seagate Recovery Services. " ​Seagate Recovery Services is the world’s first ISO 9001:2000 certified recovery services provider. We have lab facilities located throughout North America, Europe and Asia and offer a complete range of services to meet your needs. Our “no files, no charge” recovery policy puts you in control every step of the way. Seagate is the world's leading hard drive manufacturer and innovator in recovering the data with corruption, virus attack, mechanical or human errors from all digital media​​.